This set of Polymer Engineering Multiple Choice Questions & Answers (MCQs) focuses on “Polyethylene-1”. 1. What is the pressure range for the polymerization process of low density polyethylene? Explanation: The polymerization process of ethylene by free radical polymerization takes place under high pressure ranging 1500 to 3000 atm and low temperatures. 2. What range of temperature is generally employed for low density polyethylene formation on kinetic considerations? Explanation: The temperature range for the polymerization reaction is 170-250 ᵒC, on kinetic considerations because on very low temperatures, the radical polymerization goes far too slow for the production of a polymer. 3. What is the allowable quantity of oxygen at a pressure of 2000 atm and temperature of 165 ᵒC for the polymerization process, over which explosion may occur? Explanation: The allowable oxygen at a pressure of 2000 atm and temperature of 165 ᵒC is 0.075%, otherwise explosive reaction may occur giving hydrogen, methane and carbon in main, if the limit is crossed. 4. Which of the following can be used as an initiator for the formation of low density polyethylene (LDPE)? Explanation: The initiators than can be used for formation of LDPE are peroxides , oxygen or azo-compounds. 5. What is the affect of high pressure on the molecular weight of the polymer product formed? Explanation: The increase in the pressure increases the local concentration of the gaseous monomer in the vicinity of the transient chain radicals and thereby, increases the chances of obtaining higher molecular weight for the polymer product. 6. What is the possible heat of polymerization of ethylene? Explanation: The heat of polymerization of ethylene is 800-1000 cal/g which is generally higher than other type of monomers. 7. Which of the following oxide works as a catalyst for the formation of high density polyethylene by Philips process? Explanation: The Philips process uses CrO3 (5%) supported on finely divided aluminium-silica base as a catalyst , which is dispersed in a hydrocarbon solvent like cyclohexane. 8. 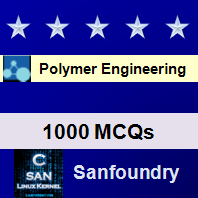 Which of the following are used as a promoter in the Standard Oil process for formation of HDPE? Explanation: The Standard Oil process uses the dispersion of molybdenum oxide containing sodium and calcium hydride as promoters in hydrocarbon solvent, at suitable temperature. 9. Which of the following process employs highest range of temperature for the formation of HDPE? Explanation: The Indiana process is operated at a temperature range of 220-250 ᵒC, whereas the Zeigler process and the Phillips process employs a temperature range of 70-100 ᵒC and 130-150 ᵒC, respectively. 10. What is the approximate density of the polymer produced by the Ziegler process of polymerization? Explanation: Ziegler process for formation of HDPE yields the polymers of density of about 0.945 g/cm3.